My wife and I went to Savannah for a little vacation and booked a haunted tour with Sixth Sense Tours. We walked to various locations with our tour guide. A few days after, I looked closely at one of my many images. 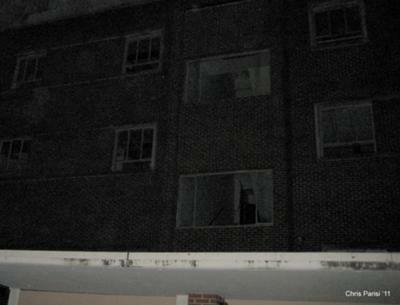 What I captured seems to be an image of a nurse in one of the larger windows of the building. You be the judge. I only had to edit the image to lower the file size and add my name. If I'm not mistaken, isn't there TWO "somethings" in two different windows? One, I guess, does look like a "nurse" and the other? Anyone else see what I see or am I mistaken?